This Saturday night the Brims Concrete Super Sedans Series, supported by Barnes Drilling, heads to the Ian Boettcher Race Parts, Kingaroy Speedway, with another strong field entered for round five of the series. This season has been very close with numerous different winners including Wayne Randall, who won the Feature race at the last event. Randall will be looking to continue that form but will have to contend with Darren Kane who has been the most successful driver at the venue in the last five years, although David Musch and Matty Pascoe have also tasted success at the venue. Randall was able to defeat Pascoe, Darren Hawkings, Gavin Northfield, David Musch and Bob McCosker in the thirty lap main event at Rockhampton two weeks ago, with all drivers with the exception of Hawkings in this weekends entry list. Justin Randall, Tania Smith, Matt and Leigh Williams and Sean Black are also in the field, ensuring Saturday nights racing will be first class. 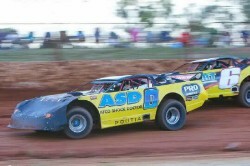 Also on the Kingaroy schedule will be events for Modified Sedans with racing commencing at 5.00pm EST.